Aloha! 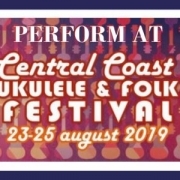 Come to the Central Coast Ukulele & Folk Festival. August on the Central Coast is such beautiful perfect weather — warm days and cool nights. Anything is possible! 2019 will another exciting year. ‘Application to perform‘ forms are now available. Applications close on 30 June 2019. To submit applications to perform or make inquiries please phone Liz 0412837007 or email info@centralcoastukuleleclub.com. The full program will be available once all acts are in. Uke Festival or Uke Feast? 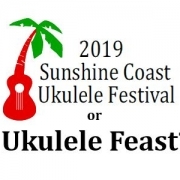 The 6th annual Sunshine Coast Ukulele Festival (11-14 April 2019) is set to bring a ukulele feast to the Kenilworth Showgrounds in the beautiful Mary Valley town of Kenilworth, Queensland. 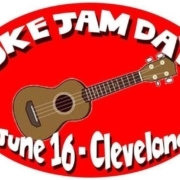 International, interstate and local artists will perform and teach their own unique styles of fabulous music and songs, all on the little ukulele, now the most played instrument world-wide. 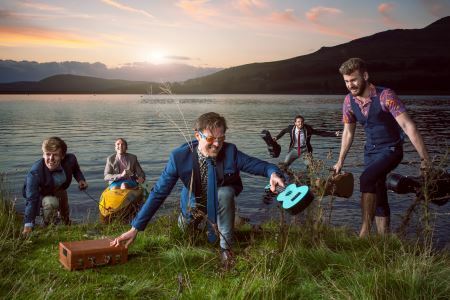 Be inspired by UK sensations, Ukebox (https://www.ukeboxband.co.uk/), and USA solo artist, Victoria Vox (https://www.victoriavox.com/). 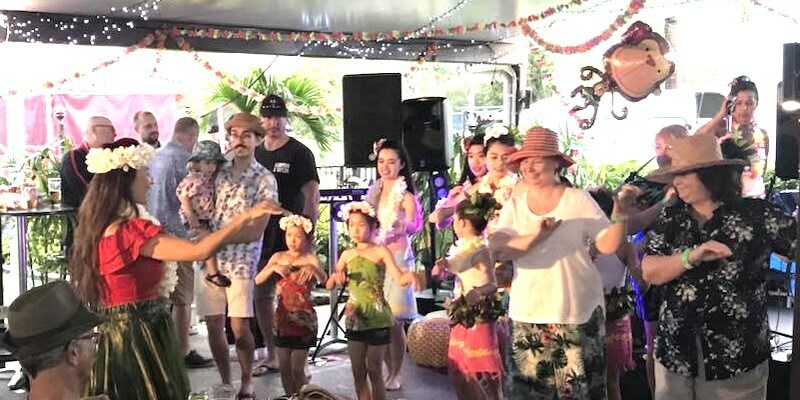 Brisbane performers and workshop presenters feature greatly in the program — Vic Kena, The CAGE, Free Range chUKES, Hint of Rosemary, Kine Kool, BFG, Hypnotonics, Duke Ukem, Ukulele Saints, Mama Juju and the Jam Tarts, Miss Elm and Donna & Derek Farrell. There’ll be lots of great workshops to suit all standards of ukulele playing, and workshops on singing, dancing and drumming. excitement for everyone going on this trip. 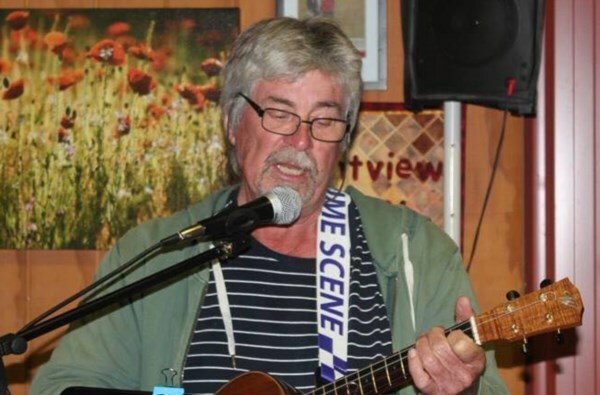 Other activities include the annual songwriting competition, open mic sessions at the Kenilworth Hotel and spontaneous jam sessions popping up all over the place. The joy of singing and playing ukulele in groups of like-minded people of all ages, race & gender is incomparable. It brings people together for the love of making music and singing like nothing else does. Everyone is welcome to come along. Bring your tent or caravan, or come for a day trip. For ticket and site bookings and other festival information go to website. 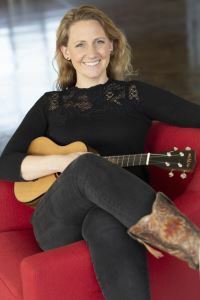 https://www.brisbaneukulele.com/wp-content/uploads/2019/03/SCUFBanner_600x300.jpg 300 600 Keryn https://www.brisbaneukulele.com/wp-content/uploads/2017/03/BUMSInc_fromESPfile_266x156dpi.gif Keryn2019-03-20 20:41:372019-03-25 20:41:55Uke Festival or Uke Feast? 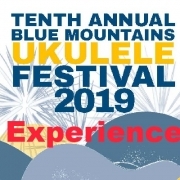 Been to the Blue Mountains Ukulele Festival? The experience is unique. In its 10th year, the multi-award winning event, is held at Katoomba NSW, in and around the iconic Carrington Hotel. 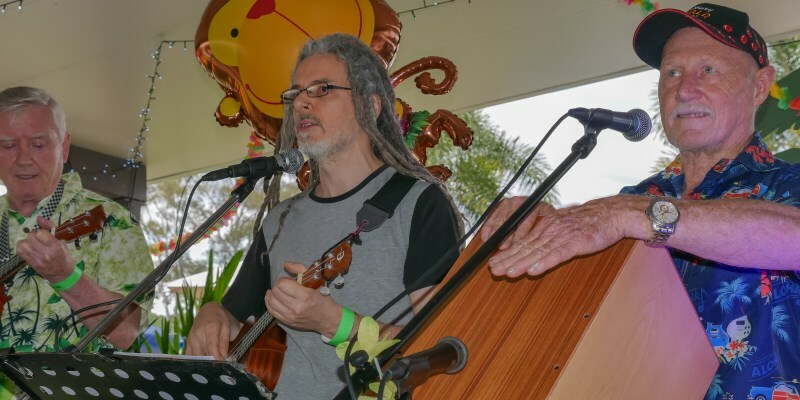 Tom Richter from Maleny Ukulele tells about this year’s experience. Some went by road, in caravans and motorhomes (or cars unconnected to mobile habitation), running down the Newell or the New England or the Pacific Highways. Some flew and jumped a train up from Sydney. 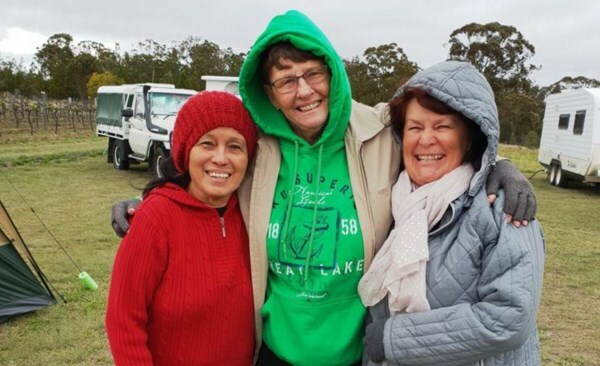 All were in connection via social media, comparing the attractions of Coonabarabran versus Glen Innes versus Grafton. Assembling at Katoomba Falls Tourist Park (booked well in advance to ensure adjoining sites), various activities were planned (hiking, mountain biking, sight-seeing, partying, lazing around), practice sessions were scheduled, song endings were altered, complaints were filed about song endings being altered, and a general ‘feel of the place’ was obtained. The Ukulele festival, run by the Blue Mountains Ukulele Group (Blue MUGs), is held annually in and around the heritage-listed Carrington Hotel in Katoomba, with workshops taking place in the Cultural Centre. Getting around the venue is easy, and there are many restaurants and eateries within a short walk. On the Friday night, a gentle easing in to the festival occurred, including jamming with the host group from their popular songbooks. Saturday was the main day of the festival, and our own Tom Richter conducted a jam-packed workshop in the morning. Tom Richter leads sellout workshop at BMUF, 2019. He also played a solo set at the City Bank Bar (with assistance on uke and vocal harmonies from some of the very talented MU members). Maleny Ukulele’s own set was the closing slot at the Baroque Night Club. Assembling in the very cosy green room, ukes were tuned, straps were adjusted, flowers were applied to hair, last-minute questions were whispered, and then we were announced by Unkle Cyril, our wonderfully eccentric MC. As we launched into our first song, we knew it was going to be great. The sound was amazing, the crowd was transfixed, and we were on fire (doesn’t always happen). Although they knew there was a ‘no-encore’ policy, the crowd bayed for one anyway. Maleny Ukulele performs at BMUF, 2019. I thoroughly recommend the Blue Mountains Ukulele Festival. The setting is sublime, the festival well-run and the acts (although no international mega-stars) are very good. Take some time either side of the festival if you can, because it is a long way to travel and there is so much to see and do in the beautiful Blue Mountains. Ging, Marg and Lori rug up for the unseasonal weather. 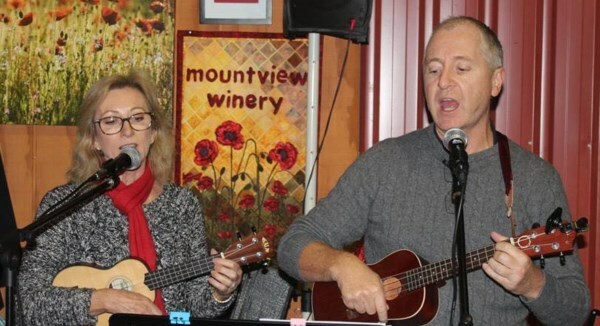 Ukuleles at the Winery was held over three days in October at Mountview Wines in Glen Aplin, 10 mins south of Stanthorpe on the Granite Belt. This was the 8th event of its kind and it’s proving to be more popular each time. While the weather was not too kind to us, with cooler temps around 13 and interment showers most of the weekend, the cellar door fire and the beautiful wines of Mountview keep everyone warm and spirits high. With many vans, tents and cars arriving early on the Thursday, we saw the festival kick off early with some impromptu jams and lots of catch up hugs and laughs. Friday and Saturday were filled with strum and play sessions, workshops of all kinds and jams sessions to practice for open mic. This festival saw many regulars and also some new faces which added to the mix on open mic night, lots of new talent with everyone remarking what a great night was had by all. Saturday workshops proved popular with some new skills shown and learnt. Learning to write a song with John Nicholson, was fantastic and terrific fun. Participants had a great time with this workshop. 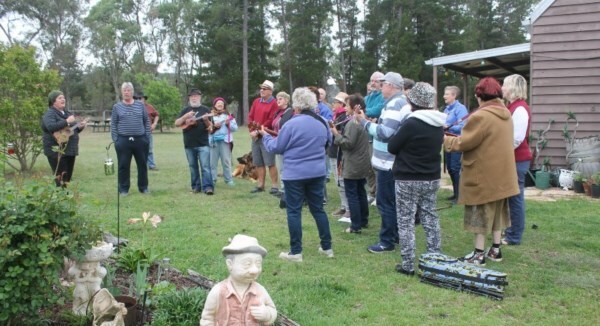 Lee Williams, a very accomplished and professional muso, was pleased by the number of people who attended his Uke Tips and Tricks workshop, and inspired by their skill levels. Roger led a bluegrass workshop that included bluegrass, 12 bar blues and circle of fifths. Lots of great info there. Phil showed us how to use a capo. This was interesting and very informative for those who hadn’t used one before. Rowena and Hans did a wonderful job in the learn a song workshop. Within an hour, participants learnt a new song to perform at open mic. They were great! Early Sunday morning we had a quite memorial for an original Uke Fest friend, June Baran. A rose was planted in June’s memory, we shared fond memories, and sang a few of June’s favourite songs. Sunday morning also bought some local Glen Aplin banjo, bass and mandolin players to jam with everyone in the cellar door with some gospel songs. Sunday morning Blue Grass Jam. 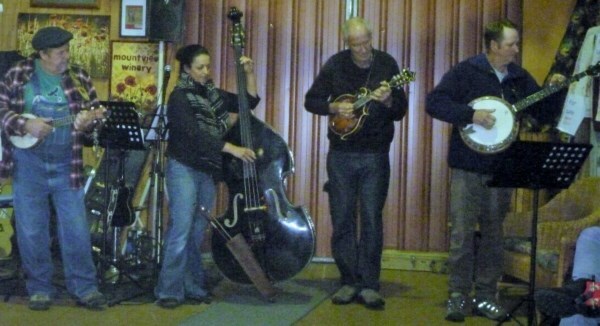 Leading the morning jam were Roger Sherack in checkshirt playing Uke Local Stanthope muso’s Dave on banjo, Rob on mandolin Dave’s wife on double bass. The morning Blue Grass jam was a huge hit. Most people enjoyed the onsite catering with meals $ 5 pp/ This option left everyone free to enjoy company, wines and some uke playing. 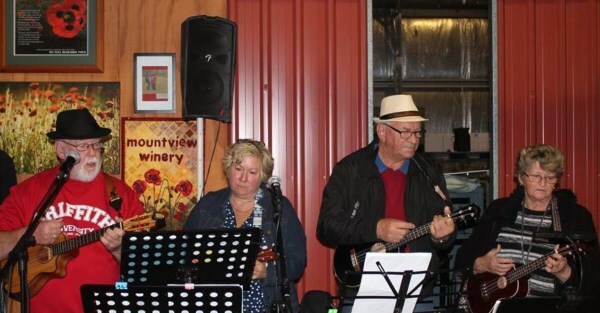 Thanks to everyone to came along and made our October 2018 Ukes in the Winery such a special event. 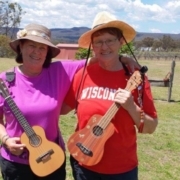 For those of you who’d like to join the fun, Ukes at the Winery is held twice a year. The next event is in March 2019, date yet to be released. Thank you very much Leona Counsell for sending us this video. 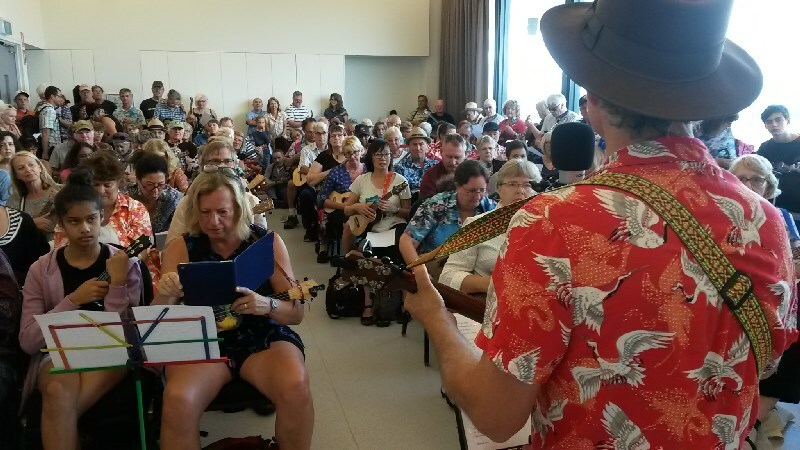 Rarotonga, in the Cook Islands, is holding their very first ukulele festival in March 2019, and we have received an invitation for Brisbane Ukulele Musicians Society members to attend. The Golden Ukalele Festival will feature unique Pacific and International Ukalele Rhythms. The 15 islands of the Cooks are located in the heart of the Pacific, halfway between Hawaii and New Zealand. An oasis of freedom with crystal blue waters, white sandy beaches, warm weather all year round and authentic, friendly locals. Under 30 minutes from plane to any beach, it’s so easy to do as much or as little as you like in the Cook Islands. 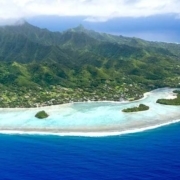 Rarotonga is ringed by boutique hotels, resorts, restaurants, gift shops, galleries, coffee spots and convenience stores. This is a great opportunity to experience the Kia Orana spirit and discover this piece of paradise. The Golden Ukalele Festival is scheduled for March of 2019, Saturday 16th to Thursday 21st. 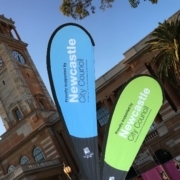 There are lots of activities over the six days including an Expo, a Parade and Concert. 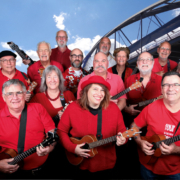 Join with other ukulele players attending church services around Rarotonga, and the Golden Ukalele Award night, where every ukulele player will be part of the nights ukulele orchestra – sure to be the highlight of weeks festival! Transfers: Airport meet and greet as well as transfers to and from your accommodation. Transport also provided for Sunday church service. Festival Pack: Your official Festival programme, concert event entry tickets as well as meal vouchers. Goodies: A local pareu (sarong), T-shirt, commemorative pearl shell carving, music sheets. 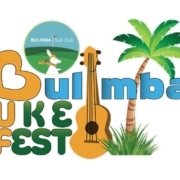 We are looking for expressions of interest from BUMS who are keen to travel to the Cook Islands and participate in the Golden Ukulele Festival. 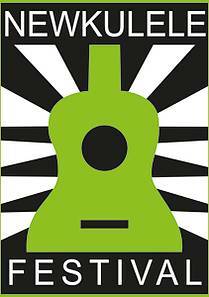 If that’s you please contact our Events coordinator Geoff Dancer via events@brisbaneukulele.com. All travel costs are the participants own. ‘Kia orana’ is how the Cook Islanders say ‘hello’, and ‘Kia manuia’ is how they say ‘good bye’. Norma O’Hara Murphy, the Coordinator of Bony Mountain Folk Festival, has invited all BUMS to their eighth festival 14, 15 & 16 SEPTEMBER 2018. Norma promises a fabulously full weekend featuring some of Australia’s finest. A celebration of everything Australian! Bush Bands-and celebrating the life & legacy of Slim Dusty. Several great bands-Slim’s family- Anne Kirkpatrick & family- Dianne Lindsay & Peter Simpson-Phil & Chris Coads Band -Bluegrass/Country/Ukulele -Our best Balladeers Dean Perrett- Jeff Brown- Cape Byron Celtic Dancers- Pipe Bands. Fabulous Friday will feature Hillbilly Goats, an exciting energetic group (complete with goat). The main weekend is dedicated to paying tribute to Slim Dusty. Redland Bay Bluegrass Boyz- Daryl Craft and much more. BUMS Ukulele Members- week long Ukulele School with Mick Angeles. You are invited to be part of it all with your own personal tribute- do you have a song, a poem or a photo, come and share it with all! Great tucker- great company- bush Barbies- Camp ovens- Firedrums! Fabulous family Festival- Pirate Cave-Treasure Hunt- great tucker- Doggie Parade with top prizes! FREE CAMPING. It’s a big year this year for Bony Mountain Folk Festival! There is a big Slim Dusty tribute- A Celebration of the life & legacy of Slim Dusty. Slim toured the length and breadth of Queensland with his caravan and his wife Joy McKean, so where better than Bony Mountain! Joy is going to try to attend this year. Norma and Slim shared two Golden Guitar wins -with Paddy William in 2001- and Cattle Dog which was Slim’s very last Golden Guitar- in 2003. Norma will perform these at the festival. 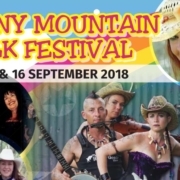 Daughter Anne Kirkpatrick, Dianne Lindsay (Slims niece) and Bony Mountain are featuring a big Slim Dusty Exhibition and also unveiling a Memorial Sandstone to honour the man & his music! All kids activities on Saturday & Sunday. Free games & activities in pirate cave all weekend.